my appetizer, was his bank account, of course. i swallowed his available balance whole, slurped up each zero, and washed it down with a big glass of his 401k ain’t i the gold digging hoe they warned you about? dessert was the sweetest, instead of purposely ordering the most expensive thing on the menu, i called up all of his exes the rightfully angry baby mamas the thots, the “crazy” ex girlfriends & we all laughed together, cracked open a bottle of red wine & raised our glasses, to man satisfying us, for once. RebeccaLynn is queer, black, and surviving in Boston. She enjoys hiphop, philosophy, and her mom’s cooking. She is a Winter Tangerine workshop alumni as well as a 2017 Pink Door Fellow. Her artistic influences include Langston Hughes, Maya Angelou, and Frank Ocean. 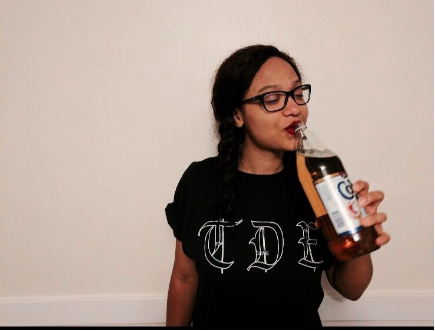 Her work has appeared in Maps For Teeth Magazine, Slam Chop, and Black Nerd Problems.